“Your brain’s important, but not all that important,” said Dr. James Paul Gee, a professor at Arizona State University and a leading authority on literacy and the potential of educational games, during a talk at the Learning and Brain conference last week. By that he means the following: What we’d assumed about the importance of brain functions – following rules and logic and calculating – are no longer relevant. There’s been a revolution in the learning sciences and the new theories say that human beings learn from experiences – that our brains can store every experience we’ve had, and that's what informs our learning process. Following that logic, he says, the best kind of learning comes as a result of well-designed experiences. FEED THE LEARNING PROCESS. The best learning experiences have the following values: motivation, clear goals, interpreted outcomes, and immediate and copious feedback. Video games have all these components. 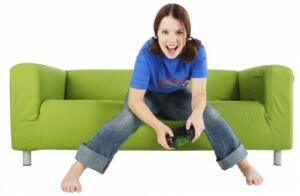 Kids play video games for fun with the goal of progressing to the next level and eventually conquering the opponent, whether that's another player or the computer. What's more, the social aspect -- sharing tactics, experiences, and explanations – helps cement what they’ve learned. OBVIATE TESTING. The current assessment system forces teachers to teach to the test. Video games hold out a different way of thinking about assessments: namely, that we don’t need it. Compare a student who’s taken 12 weeks of algebra classes to one who’s played the video game Halo on the most challenging setting. The algebra student must take a test to assess what he knows on the day of the test. The Halo player has mastered the skills needed to get to the final level – and that’s his ultimate goal. No need for a test in that context. “Learning and assessment are exactly the same thing,” Gee said. “If you design learning so you can’t get out of one level until you complete the last one, there’s no need for a test. There would be no Bell Curve. It’s unethical to test a student based on one day’s knowledge. We have to change the attitude about testing on a government level." BUILD ON EXPERIENCE. With every new game, the knowledge and expertise picked up in previous games can be applied to a new experience, a fundamental part of learning. REDEFINE TEACHERS AS LEARNING DESIGNERS. Game designers create well-designed experiences and social interactions. Teachers are designers of learning, and can create experiences tailored to suit their outcome. If we “re-professionalize” teachers as designers, they can create their own scripts for what they want students to learn. This type of learning is based on good teaching, not curriculum per se. TEACH LANGUAGE THROUGH EXPERIENCE. The biggest problem with using scholastic language is that it’s not used outside of school. “The language you learn at school is not the one you use at home,” Gee said. The best way of learning language is not from a book or a dictionary, but from applying it to an experience. For example, kids can decode even the most cryptic game manual after they play the game because they’re experiencing every image, action, and dialogue that’s described. MOTIVATE LEARNING. If a student is not motivated to learn, there will be no learning. It’s hard to motivate students to learn something like algebra without context, without motivation and the gratification that comes with mastering a video game. TEACH PROBLEM-SOLVING. When it comes to problem-solving, research shows that if you teach and test facts and formulas, students learn facts and formulas. This doesn’t correlate to solving problems. But if you teach through problem-solving, students learn problem-solving skills, plus they learn the facts – for free. ENCOURAGE RISK-TAKING. If the cost of failure is high, as it is in schools, then students are discouraged to explore and take risks. If the cost of failure is made lower, such as in video games in which the player “dies” and starts over again, students are motivated to explore all their options. They rethink goals over and over again, and try out new tactics if something’s not working. That type of learning -- risk taking -- can’t happen if the cost of failure is too high. PROVIDE VALID LEARNING MODEL FOR SCHOOLS. "We should use the learning principles built into good video games in and out of schools, even if we are not using games. The learning principles can be built into many different curricula," Gee wrote in Learning Theory, Video Games, and Popular Culture, published in The International Handbook of Children, Media and Culture. Hear more of what Gee has to say in this video from the PBS Documentary Digital Media - New Learners Of The 21st Century.